On Wednesday, January 12, 2011, the 1st Regular Session of the 80th West Virginia Legislature began with the swearing in of all lawmakers, which included six new members in the Senate and 18 new members in the House. The House reelected Richard Thompson (D-Wayne) as Speaker of the House, Greg Gray as Clerk, Oce Smith as Sergeant at Arms and John Roberts as Doorkeeper. Senator Jeffrey Kessler (D-Marshall) was elected to serve as Acting Senate President. The Senate then re-elected Darrell Holmes as Senate Clerk, Howard Wellman as Sergeant at Arms and Tony Gallo as Doorkeeper. With all of the changes, one thing remained the same on the opening day of session, and that was the State of the State address which was given in the House Chamber at 7 p.m. and discussed a number of topics including the budget, job creation, education reform, and the state’s natural resources. Both the House and Senate also received the proposed Budget Bill, the one piece of legislation that must be passed before the session ends at midnight on March 12. The $4 billion budget contains no tax increases, raises no fees and does not rely on any one-time stimulus funding from the Federal Government as a backfill to state operations. It also calls for a one-third reduction of the food sales tax from three cents to two cents. And, it includes a one-time $800 across-the-board enhancement for teachers and similar enhancements for school service personnel as well as for state employees. Budget Hearings will be held by both the House and Senate Finance committees for the first half of the session in order to study the budget more closely. Other priorities were outlined in the State of the State for the Legislature to focus on. First, is to continue to improve West Virginia’s business climate in order to attract, retain, and create good paying private sector jobs. Second, to improve and reform our entire educational system to better prepare the state’s citizens for the jobs of tomorrow. Lastly, to reinvent, simplify and make government more efficient and responsible to the people and businesses of West Virginia. Other legislative issues of focus during the session will be the reduction of the state’s drop out rates, the creation of environments conducive to learning, the elimination of high level teacher vacancies in certain areas of the state, and the development of vocational skills to include middle schools on up. For the first time in our state government’s history, legislative proceedings in both the House and Senate chambers and committee rooms will be streaming live throughout the regular session. Those interested in listening in on the events of the session can listen to “Legislature Live” at www.wvlegislature.gov/live.cfm. Through changing times in our state government, one thing is for certain...anything can happen. Senate Bill 10 would provide for a supplement of three percent to be paid to all annuitants of the Public Employees’ Retirement and Teachers’ Retirement Systems at the time they reach the age of 70. Senate Bill 14 would reduce state income taxes for state and federal retirees by increasing the exemption on retirement income in calculating the federal gross income for state personal income tax purposes. Senate Bill 21 would specify that a minimum share of coalbed methane severance tax revenue be distributed to producing counties in an amount at least equal to the share received by nonproducing counties It would also provide that the distribution method for severance tax revenues for coalbed methane producing and nonproducing counties be used. Senate Bill 22 would increase the amount of net terminal income allocated to the Cultural Facilities and Capitol Resources Matching Grant Program Fund. Senate Bill 33 would provide a system to assist farmers to make the transition from growing tobacco to growing other crops or pursuing other agricultural endeavors. The bill includes provisions that create the “Transition Program for Tobacco Farmers” as well as the “Transition Program for Tobacco Farmers’ Fund.” The bill also provides for use of the Tobacco Settlement Fund for the program. Senate Bill 36 would authorize public universities and colleges with an accredited education program to operate public schools in cooperation with the local county board of education. It would establish a pilot project allowing only West Virginia University and Marshall University to operate public schools in cooperation with the Monongalia and Cabell County Boards of Education for school years beginning prior to 2013. Senate Bill 38 would require a court to conduct a hearing at the time it sentences a defendant to jail to determine the defendant’s ability to pay the costs of the defendant’s incarceration. The bill would require the court to require the defendant to pay for up to thirty days of incarceration in jail if it finds the defendant is or will be able in the foreseeable future to pay. Senate Bill 43 would establish a procedure that requires a claimant that files an asbestos case after the effective date of this bill to provide information to all defendants about all claims filed or anticipated to be filed by that claimant against asbestos bankruptcy trusts, a mechanism for the defendant to challenge those claims, a procedure for sanctions by the court, and for set-offs for those claims. Senate Bill 44 would provide an earned income tax credit from the state personal income tax for taxpayers with qualifying children. The earned income tax credit would be equal to twenty percent of the federal credit. Senate Bill 57 would allow Supreme Court Justices to be elected on a nonpartisan ballot. This would include all details; timing and frequency of election; ballot design and printing; separation from partisan ballot; nonpartisan election of justices; filing announcement of candidacies; withdrawal of announcement of candidacies; refund of paid filing fees; and ballot content and form. Senate Bill 63 would extend the number of prohibited products included in the definition of “Salvia divinorum” (also known by the common names of “Salvia,” “Ska Pastora,” “Shepherdess’s Herb,” “Maria Pastora,” “yerba de Maria,” “Purple Sticky” and “Sally-D,” “Fake weed”, synthetic marijuana”, “K2 or Spice.”) and any of its derivatives to be covered by the criminal penalties article of the Uniformed Control Substances Act. Senate Bill 67 would require persons arrested for a felony to submit to a DNA sample; and would provide procedures for expungement if the felony has been dismissed. Senate Bill 69 would clarify that fire chiefs and line officers working with paid and volunteer fire departments are employees that are provided immunity under the Governmental Tort Claims and Insurance Reform Act. Senate Bill 72 would provide that references in the constitution, the code, joint rule, or rule of the body to the President of the Senate and Speaker of the House of Delegates, or presiding officer, include any member authorized by the respective body, by rule or otherwise, to act in the place of the President of the Senate or the Speaker of the House of Delegates. Senate Bill 82 would declare a child’s right to nurse and makes a statement by the Legislature that nursing in a public place is socially acceptable. A mother would be able to breast feed a child in any location, public or private, where the mother and child are otherwise authorized to be. Senate Bill 83 would limit the landowner from civil liability for injuries that may occur to person or property on the landowner’s property or surrounding property caused while hunting. Senate Bill 89 would include certain records of the Division of Juvenile Services in the exemptions from Freedom of Information Act requests. House Bill 2001 would limit the authority of the Parole Board to consider releasing an inmate serving a life sentence who has qualified for release on parole, to once every three years. House Bill 2464 would expand reporting requirements under the State Ethics Act to include information relating to the spouse of the public servant, and adds reporting of business interests that the public official is employed by or furnishes services to. The bill also prohibits some public servants and employees from registering as a lobbyist for a period of time following the end of their public employment. House Bill 2029 would increase the amount of annual and incremental salary increases for eligible state employees from $60 to $100. House Bill 2045 would add “sexual orientation” to the categories covered by the Human Rights Act, prohibiting discrimination in employment and places of public accommodations. This bill would also add “age” and “sexual orientation” to the categories covered by the Fair Housing Act prohibiting discrimination in housing. House Bill 2056 would create the West Virginia Renewable Energy Act. It would provide a maximum $2,000 investment cost recovery incentive for customer-generated electricity from renewable energy systems, but exempt electric and gas companies from qualifying for that incentive. The bill would also provide a $25,000 maximum tax credit for electric light and power companies that purchase customer-generated electricity. House Bill 2099 would provide a five percent increase in teacher’s salaries for each of the following school years, 2010-2011, 2011-2012, 2012-2013, and also add pay increments for certain teachers. House Bill 2129 would provide a mandatory sentence of 15 years for any person who maliciously shoots a police officer on duty, while providing a mandatory sentence of 10 years for any person who unlawfully, but not maliciously, shoots a police officer on duty. House Bill 2159 would prohibit members of the news media from being compelled to give testimony in any court in the state relating to the source of information in the public communication without the consent of the person or persons providing the information relied upon for the public communication. House Bill 2161 would create the Herbert Henderson Office of Minority Affairs. This office would provide a forum for discussion of issues that affect the state’s minorities. The office would also provide recommendations to the Governor and the Legislature regarding the most appropriate means to provide programs and services to support minority groups in the state. House Bill 2201 would provide for a comprehensive drug and alcohol free program for miners. Mine operators would be eligible for a credit on their workers’ compensation premiums if they have established a drug and alcohol free mine workplace as provided in the bill. The bill requires proof of drug and alcohol free status in order for miners to be certified. Mine inspectors are required to receive training in drug and alcohol abuse and a statewide database of miners failing to provide proof of alcohol and drug free status would be established. House Bill 2394 would protect academic speech of professional educators. This legislation would provide that an employee in West Virginia public schools or a higher education institution may not be disciplined, denied employment or denied promotion or tenure based upon his or her speech, research or writing related to public issues The bill would not protect speech or actions that constitute a crime. House Bill 2437 would require that all cutter heads, long wall shears and other mining machines automatically shut-off when the methane level reaches one percent. House Bill 2440 would allow the Division of Energy to develop an energy related public relations campaign focused on educating Washington, D.C. area and the federal government about West Virginia coal. House Bill 2490 would prohibit the use of a mobile communication device to engage in text messaging or additional technologies while operating a motor vehicle. A person found in violation of this measure, if convicted, would be guilty of a misdemeanor and fined no more than $250 for a first conviction. House Bill 2514 would require reclaimed strip mines to be populated by plants that are beneficial to the local bee population. 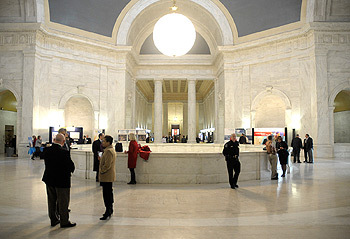 Known across West Virginia for its ornate architecture both inside and out, the Capitol Rotunda also serves as host to a flurry of activities and impromptu business during legislative sessions.